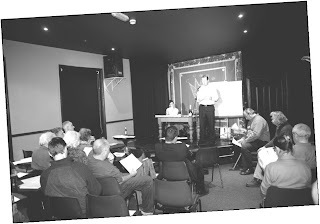 Thank you to everyone who came along to our very sociable AGM at The Hob on 15th October. You can read the full minutes can be found here but here’s a flavour of the evening. The main news is that we now have a new chairman. Having chaired the Society from its inception, Michael Abrahams decided to step down and Peter Irby was elected to carry on his work. Peter has been vice chairman of the Society for the last year and we are delighted that he has decided to step up to this new role. We’re not losing Michael completely though. He’s going to stay on as vice chair and will also chair the Planning Committee. 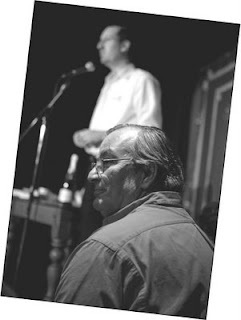 One of Michael’s final acts as Chair was to present his annual report to the Society. This too can be seen on our website. Liz Hannaford (Communications Officer) then thanked him for all the hard work and time he’d put into the Society and, after a highly deserved round of applause from the members, he was presented with a gift. Apart from Peter and Michael swapping places, the Elected Officers for 2008-2009 remain the same. In addition, we now have 16 Executive Committee Members. Many of these are carrying on from last year but it was great to see so many new faces coming on board. This is a very healthy sign and means that we should have continuity as well as fresh blood to make sure we don’t get too stuck in our ways. There were no guest speakers at this year’s AGM because we wanted to leave plenty of time for members to discuss issues that concern them so that we can set priorities for the coming year. Judging from the questions from the floor, it looks like the Planning Committee is going to have a busy time ahead. Members discussed the poor appearance of our town centre, specifically shop fronts and the lack of a planning vision for our area. The problem seems to be a lack of planning officers in Lewisham. However, Jeff Lowe (Havelock Walk artists’ quarter) did announce that Lewisham’s Regeneration Department had recently told him they would enforce the Council’s own shop front guidelines but only for new frontages, not existing ones. Members voiced concern about traffic problems on Honor Oak Road and asked for a pedestrian crossing on the junction of that road with London Road. This is a particularly important junction for pedestrians in our area since it’s on the walking route from the station to the Horniman Museum. 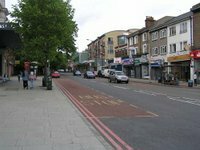 On a positive note, we heard that the group of roads around Rockbourne Rd – the Rockbourne Triangle – had been declared the winner of Lewisham’s eco-streets competition, partly in recognition of the Stanstead Road Community Garden. The area will become Lewisham’s centre for excellence for eco-issues and this was a good opportunity for the FH Society to become involved. 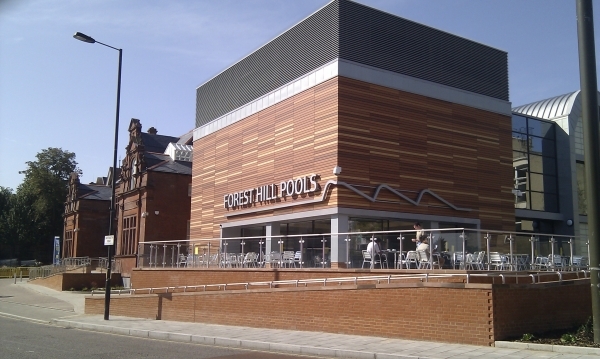 Inevitably, we spent a good deal of time discussing the now very uncertain future of Forest Hill Pools. Members were unhappy with the Council’s handling of the redevelopment, specifically the listing of Louise House. The Council must have been aware of the application to list it and yet seemed totally unprepared for the news that the application had been successful. There was a strong feeling at the meeting that the priority for the Society should be to press for an architectural competition to ensure a good design for the new pools. Many members, however, felt the outward appearance was of secondary importance compared to the provision of fantastic swimming facilities in our area. So, plenty of issues for the Committee members to get their teeth into. If you’d like to get more actively involved with these and other issues, you don’t need to wait until next year’s AGM. Just contact Peter Irby to discuss ways in which you can help. We’re always pleased to hear from you.